The fish with the honor of having the longest Hawaiian name is the lauwiliwilinukunukuʻoiʻoi. Freely translated this name means “long-snouted fish shaped like a wiliwili leaf”. The wiliwili tree, by the way, is endemic to Hawai’i. It’s name means “repeatedly twisted”, and you can see why. If you feel like twisting your tongue, see if you can pronounce “lauwiliwilinukunukuʻoiʻoi” 3 times in a row. One tip: first listen to someone else trying. If you count carefully you will find 23 letters in “Lauwiliwilinukunukuʻoiʻoi”, as well as two “ʻokina” signs (the apostrophe which denotes a glottal stop). Since the okina is an official letter in the Hawaiian alphabet this gives the Lauwiliwilinukunukuʻoiʻoi a total of 25 letters! Some people say that the humuhumunukunukuāpuaʻa is the longest Hawaiian name for a fish. This is not true, because it “only” has 22 letters (counting the okina). Luckily the humuhumunukunukuāpuaʻa has another honorable distinction: it is the state fish of Hawai’i! The name lauwiliwilinukunukuʻoiʻoi is used for two species of longnose butterflyfish: the Forcipiger longirostris and the Forcipiger flavissimus. Both can be found in the water around the Hawaiian islands, and the main difference between the two is that the former has a jaw that is about one third longer. Funnily enough, the name of this fish in Latin and English is also based on its elongated, forceps-like jaw: Longnose butterflyfish ( Forcipiger longirostris) and Foreceps butterflyfish (Forcipiger flavissimus). 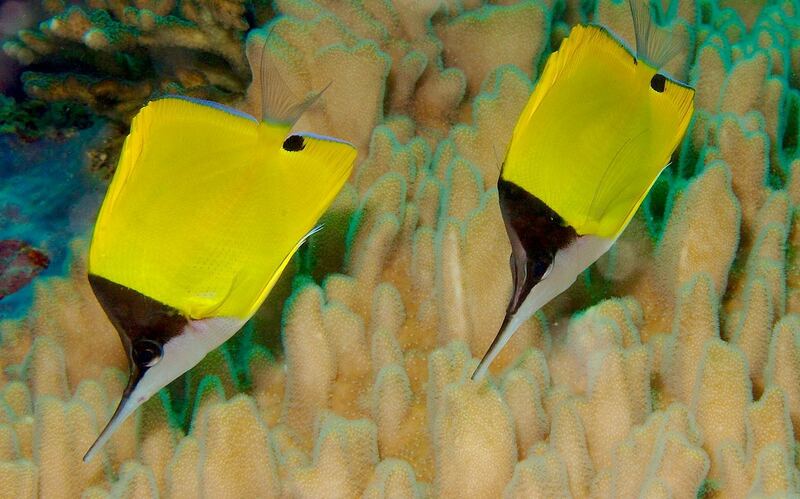 Another cool fact about the lauwiliwilinukunukuʻoiʻoi is that they mate for life, jut like other butterflyfish species. Monogamous relations are not common in fishes, and mostly found in tropical and subtropical waters. Care needed from two parents, joint defense of territories, and difficulties in finding a mate all can play a role [source]. Finally, The lauwiliwilinukunukuʻoiʻoi was collected and described during Capt. James Cook’s third voyage, between 1776 and 1780. This makes it the holder of the questionable distinction of being the first Hawaiian marine organism to be collected and named by a European scientist.